A cosmic crow is making an appearance in the southern nightsky this week and can be spotted about a third of the way up from the horizonat around 10 p.m. local time. Weather permitting, the sight will giveskywatchers a glimpse of the famous Sickle of Leo, and probably the moststriking star pattern in the spring southern sky for those living at mid-northernlatitudes: Corvus, the Crow.? This celestial bird appears as a small, moderately brightquadrilateral-shaped pattern of stars ? like a triangle whose top has beenremoved by a slanting cut. Add a fainter adjoining star, known as Alchiba, andthe pattern resembles the battened mainsail of a Chinese junk.? Corvuscan also be used to positively identify the bluish first-magnitude star Spica,in Virgo. Just follow the direction of Corvus? slanting top to theeast (to the left) and you will soon arriveat Spica. 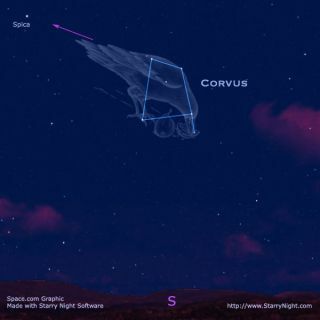 It almost appears in the sky as if Corvus were poised, waitingfor a chance to grab at Spica, which represents a spike of wheat held inVirgo?s hands. In a way, this makes some sense, since crowsare omnivores and will eat almost anything. They are also extremely smart. Theywill cautiously hop near whatever attracts their attention, then leap in and grab it. Corvusis supposed to represent the unfaithful raven of the god Apollo. The bird wassent out with a cup for some water, but instead loitered at a fig tree untilthe fruit became ripe. He then returned to Apollo without the cup, but with awater snake in his claws, alleging the snake to be the cause of his delay.? Aspunishment, the angry Apollo changed Corvus from silvery-white to the blackcolor that all crows and ravens bear to this very day. In addition, Corvus wasforever fixed in the sky along with the Cup (Crater) and the Snake (Hydra),doomed to everlasting thirst by the guardianship of the Hydra over the Cup andits contents. Interestingly, when thefour-sided Corvus has reached its highest point in its course across the sky,it stands directly above Crux, the famous Southern Cross,which is also attaining its highest point above the South Pole of the sky.? But unfortunately, even at itshighest, the Cross remains out of sight below the horizon nearly everywhere inthe United States. To see Crux, one must go at least as far south as latitude25 degrees north. That means heading to the Florida Keys in the continentalUnited States, where you?ll see it now just lifting fully above the southernhorizon. A slightly better view isafforded to those living in Hawaii, where the Cross appears a few degreeshigher. But for those who live in the Southern Hemisphere, the Crossis by far the most well-known constellation, even prominently displayed on thenational flags of Australia, New Zealand, Papua New Guinea, Samoa and Brazil. Thosesouth of the equator (where it is now late autumn), need only cast a glancetoward the south where they?ll see the distinctive shape of the Cross hangingwell up in the sky.? To some, it looks more like a kite, though the Cross isclearly outlined by four bright stars, two of which, Acrux and Becrux are ofthe first magnitude. From top to bottom, Crux measures just 6-degrees ? only alittle taller than the distance between the Pointer stars of the Big Dipper. Infact, the Southern Cross is the smallest (in area) of all the constellations.Like the Big Dipper of the northern sky, the Southern Cross indicates thelocation of the pole and as such is often utilized by navigators.? The longer bar of the Cross points almost exactly toward thesouth pole of the sky which some aviators and navigators have named the ?southpolar pit? because, unfortunately, it is not marked by any bright star.? It is thought that Amerigo Vespucci was the first of theEuropean voyagers to see the ?Four Stars,? as he called them, while on histhird voyage in 1501. But actually, Crux was plainly visible everywhere in theUnited States some 5,000-years ago, as well as in ancient Greece and Babylonia. According to Richard Hinckley Allen (1838-1908), an expertin stellar nomenclature, the Southern Cross was last seen on the horizon ofJerusalem about the time that Christ was crucified. But thanks to precession ?an oscillating motion of the Earth?s axis ? over the centuries, the Crossultimately ended up getting shifted out of view well to the south. Immediately to the south and east of the Cross is apear-shaped, inky spot, about as large as the Cross itself, looking like agreat black hole in the midst of the MilkyWay.? When Sir John Herschel first saw it from the Cape of GoodHope, South Africa in 1835, it is said that he wrote his aunt, Caroline aboutthis ?hole in the sky.?? Indeed, few stars are seen within this hole and it soonbecame popularly known as the ?Coalsack? which initially was thought to be somesort of window into outer space. Today we know that the celebrated Coalsack isreally a great cloud of gas and dust that absorbs the light of the stars thatmust lie beyond it. Soit is that the four stars that outlines the figure of a wily crow, also revealsthe position of another four-star pattern whose name is known to almosteveryone though invisible to many of us.? ?